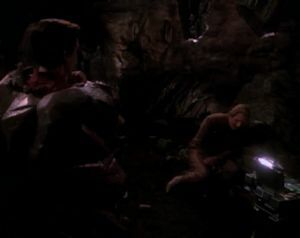 Kira is trapped by a growing crystal formation and Odo refuses to abandon her. Meanwhile, Nog announces his intention to join Starfleet. Bareil's body is practically still warm, and the writers are already trying to develop the Kira/Odo relationship. As much as I disliked Bareil, this comes across as pretty tactless, especially since Bareil isn't mentioned once in this episode. Nog's aspirations for Starfleet seem to come out of left field, but they make perfect sense from a character point of view. It also allows the writers to finally do something interesting with the character, and here they use him to confront Sisko's own prejudices. This is a stroke of brilliance. Kira tells Odo she's trapped, and Odo says, "Stay where you are!" Why don't they just dig the crystal out of the ground? I love the idea of Ensign Vilix'Pran, a "man" who is "budding" in a "hatchling pod" and having O'Brien and Bashir throw him a baby shower. Talk about a character that throws conventions on their head! Since he isn't seen on screen, it lets the writers just go crazy imagining him. O'Brien is still kayaking, as we first learned about in TNG's "Transfigurations." The twist at the end--that Kira is actually the female Changeling--is genuinely perfect. It lets the writers draw out the Odo/Kira relationship a little longer, it keeps the Dominion alive and well in the DS9 universe, it demonstrates Odo's intelligence in figuring it out, it makes perfect sense, and it's difficult to see coming. On the whole, a very good episode. The A-story reminds me of the sequence in The Abyss in which Lindsey is trapped in a sinking submersible and Bud refuses to leave her. It starts out as a seemingly minor problem that the characters laugh off at first, but quickly escalates to a realization that the woman is going to die and there's nothing the man who loves her can do about it. Granted, this story ends in a completely different way (somehow, I doubt The Abyss would have been as good a film if Lindsay suddenly turned out to be one of the aliens), but I just love the idea of something simple and dismissive gradually turning into an unstoppable problem that dominates the plot. As for the B-story, it's wonderful to see a character like Nog embrace Starfleet even as other kids we've seen in Star Trek (Wesley, Jake) reject it.